A while ago, I posted a review of the stupidest book I'd ever read. 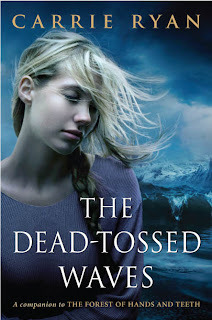 That was until I read the sequel, The Dead Tossed Waves. What can I say? I'm a competionist when it comes to books, even if it's garbage. And, yes, the sequel was garbage, but not in the fun What the hell are you doing?? How have you survived this long, you stupid whore?? kind of way like the first one was. It was boring. In fact, I skimmed maybe even most of it. There were a lot of pages where I read one sentence, just to be sure the author was still describing the same thing. It took twenty pages for two people to cross a bridge. It's like the Dragon Ball Z of trite post-apocolyptic zombie romance. The basic story takes place maybe almost thirty years after the first one. Stupid Whore is grown up and has a daughter of her own. Stupid Whore Junior is the opposite of her mother--she doesn't give a hoot about traveling to another place just for the hell of it, doesn't think it's a good idea to run through zombie territory for any reason, and she's blond. Her friends try and convince her to hop the fence with them to hang out at the abandoned amusement part, to which she says screw that... until the boy she likes asks her to come. So she does. And they all die. Because you don't hop the damn zombie fence, you retards. Well, obviously, she doesn't die. And neither does her boyfriend, even though he's been bitten. It turns out he's immune to the virus, and is now a carrier. Which means that they cannot make out any more. Which leads to many scenes with them pressed up against each other and breathing heavy. They run away together. With some other guy who just randomly came out of the woods and decided to start following Stupid Whore Junior around. She spends a lot of time breathing heavy with him too. In fact, she alternates. And she doesn't even seem to feel bad about it. Can't choose between the two guys you're traveling with? There can be only one solution: Dry. Hump. Everything. Oh, and Stupid Whore Junior murders someone before she leaves. Like straight up stabs him in the torso and flees. So they run into the forest, being chased by some army guys. The army guys mostly want to bring in the infected but immune guy. Why? Because the zombies won't eat him, which means he can kill them easily. He can, like, walk into the middle of a group of them, hand one of them a bomb, and then walk out. Or he can go get supplies without being attacked. At this point I'm thinking... this party basically consists of a girl who murdered someone so that she could flee and be with her boyfriends, and a guy who could really help the anti-zombie effort but doesn't feel like it. And I honestly don't think the author realizes she's turned her protagonists into the bad guys here. Despite this, for some reason I cannot fathom, they're running away from the army guys and towards the capitol city... which I'm pretty sure is where the army comes from. Which probably makes the least sense of anything that has happened in either of these books. They don't even get there by the end of the book. It's just, like, over. After making out with Random Tag-Along guy, he's all smiling and walking down the path backwards... and steps right off the edge of a cliff. Seriously. All this fleeing from the army and from zombies, and he's done in because he can't watch where he's going. They pull him up, but his leg is broken so... they leave him and move the heck on, of course. This is good, though, because it leads to one of my favorite moments in fine literature of all time. So Stupid Whore Junior and her infected boyfriend are still being chased by army guys when they come across a school bus. Upon further inspection, the bus is full of first graders in matching little blue sweaters. Hundred-year-old zombie first graders. The author even describes how they look almost alive and have pig tails. How do our protagonists react? They start picking up the zombie first graders and chucking them at the army guys. The "good guys" pick up. Dead six-year-olds. And throw them. At soldiers. The whole scene was just beautiful in its insanity. So the third book is out, and, on the one hand, I'm kind of excited to find out what shenanigans the author manages to conjure up this time, but, on the other, I'm not sure I have many more brain cells left to spare.